These two essays by longtime members of the Asian studies program at Bates offer completary thoughts about the presence of Mao Jacket at Bates. Professor of History Dennis Grafflin, the College’s first permanent appointment in non-Western history back in 1981, suggests that objections to Mao Jacket might be missing the ironic point. 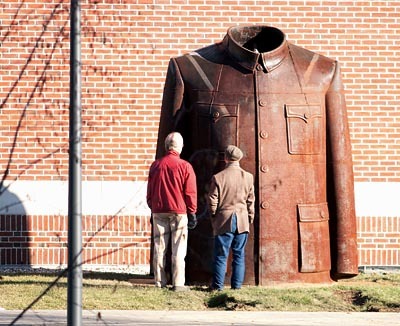 My guess is that if the piece were by a contemporary American sculptor, displayed a Western suit coat, and was titled George W. Bush, the near-universal reaction would be that representing the president as a rigid hollow metal shell was an act of savage critique. Yet this work by contemporary Chinese artist Sui Jianguo has repeatedly been taken to be glorifying Mao in particular and communist rule in general, as if there could only be one Chinese thought pattern, irrevocably rooted in Marxism. My own suspicion is that, at this moment, it would be easier to find American artists praising George W. Bush without ironic intent than it would be to find Chinese artists wholeheartedly praising Mao Zedong. Foreign political art, in particular, tends to be seen in terms of one’s own limited understanding of other people’s complications. Not surprisingly, it’s easier to perceive ambiguity in art that comes out of one’s own cultural background. Foreign political art, in particular, tends to be seen in terms of one’s own limited understanding of other people’s complications. When the sculpture stood in New York City, a critic asked angrily how it was different from displaying the jacket of a Waffen-SS officer, with the implication that such a display would be instantly stopped. But what if the Nazi uniform sculpture bore the name of Anselm Kiefer, famous for a career built out of dark broodings on Germany’s poisonous modern history? Would that convert the sculpture into a horrific memorial warning, or would its straightforward representation still be inherently glorifying? When Jasper Johns’ flag paintings are exhibited overseas, should they be equipped with warning labels reading, “May Not Be Simplistic Patriotic Statement,” to help out foreign viewers? In the end, I’m inclined to think that if any significant percentage of the Bates student body actually looks hard at a piece of sculpture and develops personal opinions about it, that’s all good news. 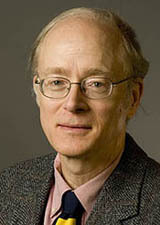 Professor of History Dennis Grafflin, the first permanent appointment in non-Western history, came to Bates in 1981. On what side of fame does Bates stand? Many breathtaking specters have descended upon the Bates campus in recent years, but few can top the apparition of Chairman Mao cloaked in his legendary, larger-than-life jacket. We are told that this piece of public art was the creation of a sculptor both famous and influential in his home country of the People’s Republic of China. But what makes an artist famous and influential in that country? And on which side of that fame and influence do he, the artist, and Bates, his host, stand? Perhaps it’s just the folly of morons stuck in the political, ideological, and precapitalist past to argue fine points. Or perhaps I am missing something. Perhaps Chairman Mao has transcended political and ideological divides the world over, now that his country has become downright capitalist. Perhaps it’s just the folly of morons stuck in the political, ideological, and precapitalist past to argue fine points. If we forget about Tibet and the Dalai Lama, the College may even receive a gift of an endowed Chairman Mao chair in a well-placed department. Does our own Mao jacket include his underwear made of fine material? It’s been frightfully cold lately. The reaction on campus that I like most came from our own students. Two women stood in front of the jacket and pondered its identity. After some deliberation, they decided it looked like a Chanel suit. Bravo! Though I have never heard of cotton Chanel suits, perhaps the rusty metal jacket nestled against Pettengill Hall really does represent Communist Mao’s warm, fine outfit, suitable even for his capitalist offspring. Therein must lay the political correctness of this particular objet d’art. Atsuko Hirai, the Kazushige Hirasawa Professor of History, joined the Bates faculty in 1988.